Its here! Go to WQRadar.co.uk to find our latest product. 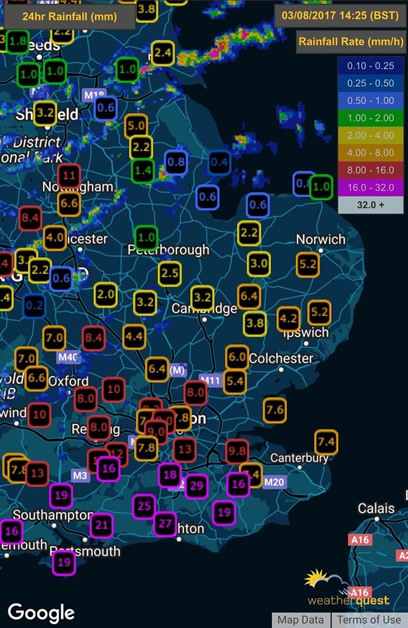 Weatherquest has developed a new UK weather radar visualization tool which gives you an up-to-date view of rainfall intensity and lightning flashes all on one easy-to-view screen. It will work on your mobile, PC or laptop to keep you in the picture, wherever you are. ...these observations can be overlain on the radar image so that you can see what the rain has done in terms of temperature change, rainfall total and wind gusts, for example. If you need to be prepared for rain at the local cricket, tennis tournament or village fete, this display will keep you in the picture. In the winter it will show the different precipitation types, rain sleet or snow, so you can take a better route to avoid any disruption. If you are working in the harvest field or walking in exposed locations, say on the golf course, then an add-on feature may help you to stay aware of any lightning activity nearby. WQRadar will send you a text and or email to your mobile if lightning is detected within 50km (35 miles). These messages will give the time of the flash, its distance and bearing. It will then send updates every 30 minutes. The on screen display of the radar, of course, updates with the latest flashes as they happen. The login and set up procedure is very straightforward and there is a YouTube video accessed from the front page to show how to do this. Signing up for a yearly subscription works out less than £4/month, which includes email lightning alerts; text alerts cost extra.